History: Both of my grandfathers were bakers. Adolph, my paternal grandfather, worked for the now defunct Jersey Bakery in Hudson, NY, after he sold his dairy farm. Then John, my other grandfather, worked there whenever they needed extra help or someone called in sick. I have such fond memories of the Jewish Rye they brought home. This recipe is as close to the original as can be. The only difference is they baked it in ovens that could inject steam during the first 10 minutes, which gave the crust its blistered look and chewy texture. Note: This is a must have, proper ingredient recipe! You can't substitute medium rye flour without a change in texture. Light Rye or white rye flour is a must is as 1st. clear flour. Also note that flour has a different moisture content during the winter as it does in the summer. So in the winter, you may need to add a bit more water and in the summer a little less. No more than a few tablespoons should do---this is a stiff but sticky dough due to the nature of rye flour itself. Don't be alarmed and think that you need to add more flour when you feel it! Stickness will disapear when you kneed the dough in rye flour. For your success please remember to measure exactly as baking is a science. Description: New York Jewish Rye, You won't find a better rye in New York! Preparation time: Start to finish is 4 days because you will make a sour starter---plan ahead! Stir to blend well, then cover with plastic wrap and let sit for 1 day at room temperature 68-72 degrees F.
The starter will look like this after the first day, 20-24 hours later. Next day (day 2) add 1/2 cup white rye flour and 1/4 cup water to the starter, mix well and let it sit overnight. Next day (day 3) add 3/4 cup white rye flour and 1/4 cup water to the starter, mix well and let it sit overnight. (You'll have a nice rye sour from this!) Taking a deep breath of the aroma will be alarming to your senses. Baking day: Before you start the process; feed the starter 2 hours before using it; add 1/2 cup white rye flour and 1/2 cup water and stir it in well. * Potato water---Peel and quarter 1 pound of regular potatoes, cover with water and season with some salt. Cook like you would for boiled or mashed potatoes, drain---saving the water the potatoes were cooked in. This is potato water, it gives bread a moist and compact texture. Save 1/2 cup of the cooked potatoes too, for the recipe and then enjoy the remainder of the potatoes as you like. In blender or by hand---chop/pulsed the seeds to break them up but not turning them into a powder...60% should still be almost whole. Mix for 6 minutes; 5 on 2nd speed and 1 minute on medium-high---scrap down the bowl once. The dough is slightly tacky and will be pulling from sides of the mixing bowl. 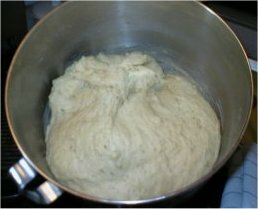 This is what the dough should look like after the mixing is complete. Proof a minimum 1+ hour and 30 minutes in a cool 68 degree area. Punch down the dough and then divide it into 2 equal weight portions and shape into balls (use only white rye flour for forming the balls) and let rest 30 minutes. 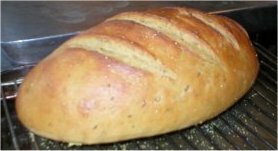 If you use regular white flour you will see it as white rings and streaks in the finished baked bread when you slice it. Using the rye flour you won't, this is a baker's secret! Form 2 loaves from the balls you made, flatten each dough ball to about 1 inch thick and into about an 8 x 10 inch rectangle. Roll and shape into an oblong loaves---look on UTube for instructions on how to do this and how to dust off the excess flour prior to proofing. Then carefull transfer each formed loaf on to parchment paper or cornmeal lined sheet pans---now slash/dock the loaves 3-4 times horizontally across the top of each loaf, about 1/2 inch deep, with a razor blade or very sharp knife. Here you can get an idea how to slash (cut diagonally) the dough. This will prevent the bread from cracking open during the baking process. Cover with a damp linen towel and then with plastic wrap and proof to double in volume, about 60-80 minutes at 72 degrees. For the rise, do it on top of your stove where is is aleady warm from pre-heating your oven. 2 minutes before baking, spray with water to moisten the dough---place a pan of water in the oven (if you like to create steam---once again go to UTube for helpfull information)---or see below how I explain it down below. So now, in goes the loaves. Close the door and bake for 20 minutes, after 20 minutes---turn the pan around in the oven and close the door again. Continue to bake the bread for 15 minutes or until center is 180 degrees F.
Glaze, get it ready during the last 15 minutes of baking, so it's ready when they come out of the oven. 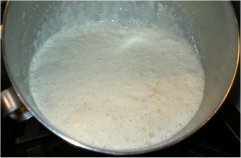 For the glaze: boil 1 cup of water, add the cornstarch (1 Tbsp) that is pre-mixed with 1/4 cup cold water, and stir continually until thickened. Cover with plastic wrap and keep warm. Remove the bread and with a pastry brush, brush with the cooked cornstarch about 1 Tbsp or so for each loaf. A small amount of this glaze is enough, it's used to create a shiny surface, look at the loaf above and notice its sheen. Cool the bread on wire racks for at least 1 hour before slicing. White Rye Flour is milled from whole rye berries which has the bran and germ removed and is unbleached. Medium rye is the next grade with is darker in color and if it were to be used in this bread it would make a darker loaf but not as dark as pumpernickel. First Clear Flour is milled from spring wheat and has a very high gluten and protein content which gives this rye its chewyness.